Toshiba’s electromagnetic flow meters are ideal for industries such as power generation, HVAC, water/wastewater treatment, pulp & paper, metals, and food & beverage. Magnetic flowmeters measure the velocity of conductive liquids in pipes, such as water, acids, caustic, and slurries. Magnetic flowmeters can measure properly when the electrical conductivity of the liquid is greater than approximately 5μS/cm. All Toshiba electromagnetic flow meters are backed by a 10-year warranty. 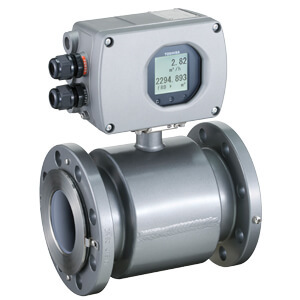 The Electromagnetic Flow Meter does not require much upstream and downstream straight run so it can be installed in relatively short meter runs.